Unity Insurance is a subsidiary company of Budget Insurance and was established in November, 2004. Until July of 2012, the insurance company Auto and General was the underwriting company for Budget Insurance (basically for Unity Insurance as well). But since then, Budget Insurance received approval by the Register of short term insurance, and following this approval, all the policies that were undersigned (backed) by Auto and General were transferred to Unity Insurance. If you want to confuse things even further, then Budget Insurance is part of the Telesure Group, which owns many of the other known insurance companies such as 1Lifedirect, 1st for women, Dial Direct, Virgin Money Insurance, AA Insurance and more. For any questions you have regarding this transfer of policies between these 3 (although really 2) companies, you can read the Question and Answer page created by Budget Insurance by clicking here. The management team includes Sean Jackson, head of brokers, and Mome Stoltz and Juan Manuel, both general managers. Where is Unity Insurance located? Unity Insurance is located at Cnr Barry Hertzog Avenue & Napier Street, Johannesburg. Their postal address is P.O. Box 11250 Johannesburg 2000. What services does Unity Insurance offer? Unity Insurance offers both personal and business insurance. Under their personal insurance, Unity has the gamut of options including personal accident insurance, funeral plan insurance, car insurance (or vehicle insurance as some call it) and home insurance. Under their car insurance choices, Unity offers 4 types of car insurance: comprehensive car insurance, third party car insurance, fire and theft, third party only and off road comprehensive. Comprehensive car insurance: This will cover you if your car is involved in an accident or if it is stolen, as well as against third party claims. Third party, fire and theft: This will cover you for specific damages to your car, such as fire, lightning or theft. You can also claim for damages to a third party. This option will not cover your car in case of accidental damage. Third party only: This will only cover you for third party claims. Unity Insurance also offers off road comprehensive and will cover you for accidental damage or if your vehicle is stolen. You can also claim for third party liability. If you opt for one of Unity Insurance’s plans, you are eligible for what they call the “Siyabonga Bonus”. This bonus rewards you by paying back your entire first year’s premiums, after 4 years of claim-free uninterrupted insurance. How user-friendly is the Unity Insurance website? When looking at Unity Insurance’s website, overall, it is a simple one with clear menu titles which allow you to navigate easily. On the downside, what help is it to be able to navigate easily, if once you get to the page you want there is hardly any information on it? Once clicking on the various choices, we found very little information available which was disappointing as a potential customer. This was particularly true regarding the company’s history, otherwise known as the “about us”. Although some customers might not care much about the history of a company, and rather focus on the costs of the policies alone, we personally think that a company’s history is very important to one’s policy. Why? Well, one reason is because if a company doesn’t have the right backing, and had to pay back a large amount of claims in one specific year, then they might not be able to stand the expenses and collapse. Alternatively, they might try to get that lost revenue by raising prices for their existing customers in the following year. Another reason is that you might be changing companies because you are not happy with the service of one company, only to find out that you moved to another company that is actually owned by the one you just moved from. So, checking a company’s history is important, and it would have been nice if Unity Insurance gave us a bit more information rather than just writing about work environment and values (which is important, but at the end of the day not something we as a customer can measure). In terms of their car insurance, Unity’s website did have a bit more information, along with links to even more detailed files regarding their options. So this is a plus. One of the biggest problems we found was the wording itself which is very small – making it hard to read. We had to look very closely, making it hard to briefly read through something to determine its relevance. In looking for information on filing a claim, there is an option on the homepage to sign in to file a claim, as well as a general phone number listed in their “contact us” section. 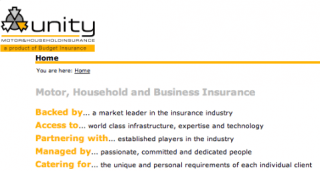 What are the customer reviews of Unity Insurance? Over the past 12 months, Unity Insurance received 120 reports through hellopeter. Compared to other insurance companies (see full list here), this is a very small amount of reports. This either means that they are a small company, or that their customers are not filing reports. Of those 120 reports, 80% were compliments and only 20% were complaints. That’s 4 times more compliments than complaints which is considered very high in the insurance industry. In looking at the nature of the complaints, they received a significantly high score in the repairs/servicing category. This implies that they could stand to improve on their car repairs and servicing providers. It is noteworthy that each of their reports, whether it was a compliment or a complaint has received a response from them. This seems to indicate their emphasis on responding to their customers – again, something that is not obvious. Although Unity Insurance doesn’t seem to stand out in any particular way (for example, by making noisy advertisements or offering some unique monthly money back offer), they seem to be doing something right – or else how can you explain that 80% of their customer reports are positive? Even if you take into account that some of the reports were inaccurate or even fake, 80% is still a very high percentage. The information about them as a company was limited, as we shared above and this is definitely something that they might want to look into. Their car insurance products and benefits are the standard of what is offered by many insurance companies – but as mentioned, maybe this is working for them. So, on the one hand we have good customer reviews, but on the other, very little information about the company and no especially memorable bonuses that make them stand out (unless you consider a no claim bonus after 4 years special). So, what does this mean? Well, it means what we always advise at the end of our reviews: ask your friends if they have ever had to claim with this company and always compare online car insurance quotes (you can receive multiple Free insurance quotes by clicking on the banner here above in this article or filling in our form on the top left side).